Relatives of those killed in the Ballymurphy Massacre have told Daily Belfast their visit to Dáil Éireann was “one of the most important and emotional days” in their campaign for truth. The families of the 11 people killed by members of the British army Parachute Regiment in August 1971 spent a day in the Oireachtas where they met a number of leading government figures. The day culminated in Taoiseach Enda Kenny calling for an independent inquiry into the killings – a call supported by all other parties. The visit started with an awareness event hosted by Sinn Féin deputy leader Marylou McDonald, where relatives described in detail how their loved ones were murdered and the impact it had on their lives. John Teggart, whose father Danny was shot 14 times, said they were able to express the lasting impact of the brutal killings. “It was shown that after 40-plus years the hurt is still as raw today as it was then,” he said. 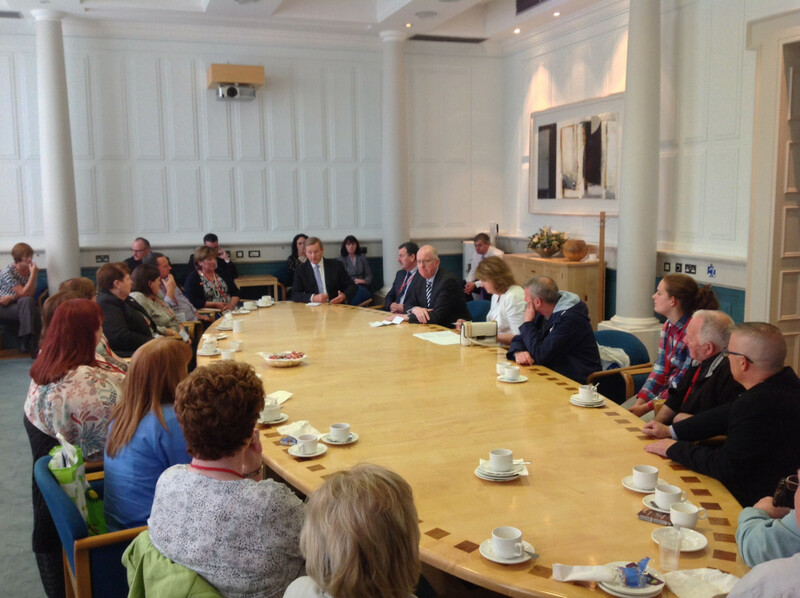 “This event was attended by members of the Seanad and the Dáil and was followed by question and answer session. After the event the families were invited to the Taoiseach’s office where they were welcomed by the Tánaiste Joan Burton, Minister for Foreign Affairs Charlie Flanagan and Taoiseach Enda Kenny. They then took their seats in the chamber where they listened intently to the debate on the need for an independent inquiry into the massacre. “We were led to the public gallery for the main event, an all party motion debate on the Ballymurphy Massacre,” said John. “Leader after leader acknowledged the presence of the families in the public gallery and commended the families on our determined and dignified campaign. The Taoiseach referred to past meetings with the Ballymurphy families, including one earlier this year at the site of the shootings. “That visit has again brought it home to me in the most powerful way imaginable – because I stood where those tragic events happened – just what these families have gone through and the great pain and suffering that they have experienced,” said Mr Kenny. The Taoiseach followed up on his visit to West Belfast in March of this year with a letter to British Prime Minister David Cameron. In the letter he stated that the British government’s decision not to put in place an independent panel to investigate the massacre was wrong and that he would continue to press for an independent inquiry along with his government colleagues. The Taoiseach finished his speech off with a reading of all the names of those who were murdered in Ballymurphy in August 1971. Fianna Fáil leader Micheál Martin said cost should never be used as an excuse for not holding an independent inquiry. “The Ballymurphy Massacre families know the truth but that truth needs to be acknowledged by the British government,” he said. Sinn Féin President and former West Belfast MP Gerry Adams also spoke during the debate. He said the day was an important step forward for the families and recalled his first-hand experience of the Parachute Regiment at his own home in Ballymurphy. He also mentioned the other massacres in the area including Kelly’s Bar and the Springhill Massacre. The motion was passed with support from all parties. “I thank Enda Kenny for tabling the motion and for his continued support over the last number of years standing side by side with us in our search for truth and justice,” said John Teggart. “I would like also to thank all party leaders and independents for the support, it’s a big step forward in our campaign, it strengthens the support we already have to date. Let’s face it: the only one outside the circle of support is the British government – they hold the key to the truth.